If the fiery volcanoes and mighty Columbia River are the heart and soul of the Central Cascades, it is the Bridge of the Gods that connects the two. There are actually three bridges – one of myth, one geologic and the present-day cantilevered metal span. They combine to capture the region’s nature, culture and history. Klickitat history speaks of the Great Chief Saghalie and his sons, Pahto and Wy’east, who settled here on opposite sides of the river. Tanmahawis, the Bridge of the Gods, connected them until they both fell in love with Louwak-clough. A fierce battle for her affection ensued, devastating the land and destroying the bridge. Fed up, Saghalie punished all, turning them into the stone mountains we know as Adams (Pahto), Hood (Wy’east) and St. Helens (Louwak-clough). The geologic story is no less catastrophic. Perhaps 1,000 years ago, but more likely 300, a giant landslide collapsed from the north side into the Columbia, blocking the river and creating a land bridge. The river eventually triumphed and the bridge crumbled, forming the Cascade Rapids (now submerged behind Bonneville Dam). 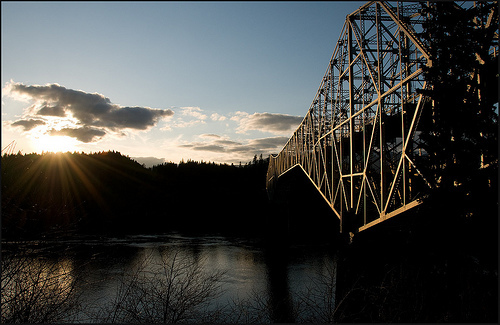 Today’s span, the very first constructed across the Columbia River, honors its history with the name “Bridge of the Gods,” reminding those who travel it by car, or on foot as they hike the Pacific Crest National Scenic Trail, of the epic mythical and natural forces that shaped the Central Cascades. Bridges are not only important physical structures, but powerful metaphorical ones too. The Bridge of the Gods crosses the Columbia River near the very heart of the Central Cascades region, physically linking the small communities of Cascade Locks and Stevenson, as well as the entire states of Oregon and Washington. But the Bridge of the Gods does much more. It links us to our Native American legacy, our natural history and our modern efforts to harness rivers, power a nation, and transport people and goods on our own schedules. It also reminds us that things can change and still stay the same. The name, the setting and nature of the Bridge of the Gods encourage such reflection in a way that crossing few other bridges does. While the form it takes may change, there will always be a Bridge of the Gods.